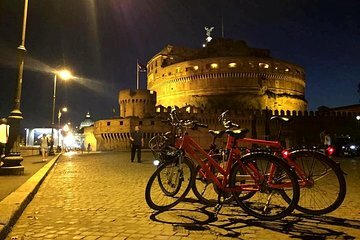 Empápate de la atmósfera de Roma al anochecer en un tour nocturno en bicicleta. Recorra en bicicleta los lugares de interés, pare para admirar la Fontana di Trevi, la Plaza de España y mucho más, además de disfrutar de una porción de pizza italiana y una cerveza mientras contempla el iluminado Coliseo. Ver las iluminaciones atmosféricas de la ciudad. Pica una rebanada de pizza y disfruta de una cerveza fría. Recorrido en bicicleta de nivel sencillo, adecuado para participantes de un gimnasio normal. What a wonderful way to get an overview of Rome! I recommend having confident biking skills because you do travel in traffic and through crowded streets. I doubted this tour would take place in the rain, but they supplied ponchos and the rain lightened to showers for most of the ride. Great way to see a historically packed city, and get to know your new neighborhood the night of your first night of your stay. It was a lovely ride through the city. Very informative and safe. I can’t remember her name but she was very helpful and due to sunset late in Rome, the ride back was the best at night. Definitely worth doing. Our guide was great. Did not really enjoy the pizza. We had a great time on this tour. The ride itself isn't difficult and it's a great way to orient yourself to Rome. We practically went straight from the airport to the tour!! We now feel we have a good sense of the city and how to get around. The pizza is served in a lovely Rome restaurant. We were the only tourists there....it was super yummy. I recommend this tour highly! !